I got word from my "spoilee" that she received my package for The Big Bag KAL & swap. So now I can post about it and not spoil any surprises! I had a lot of fun with this bag. 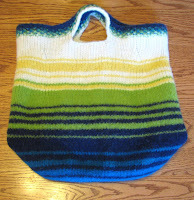 Of course, it's right up my alley -- a bag that's felted. One of my favorite things to knit. The only problem I ran into was running out of yarn. I ran out of 3 out of the 4 yarns. I'm a loose knitter, and I'm sure that's part of it. But the yarn I used (Cascade 220) has 20 yards more per skein than the yarn in the pattern. So you'd think they'd even each other out. Anyway, I was so low on the 3rd color (lime green) that I ended up adding a 5th color (yellow) so the bag would be tall enough. I think it worked out fine, but I'm glad I happened to have a color in my stash that looked good with the others. My "spoilee" gave me lots of leeway with the color choices. She just said that she likes bright colors. I looked at her Ravelry profile and found that she had knitted with a lot of blue, so I decided to use blue as the base color. And... of course.... I love lime, navy, and aqua together! One of the nice things about the pattern is that it narrows at the top a bit. 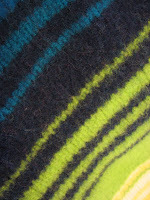 This seems to take care of the problem with so many felted bags -- the top felts wider than the rest of the bag.